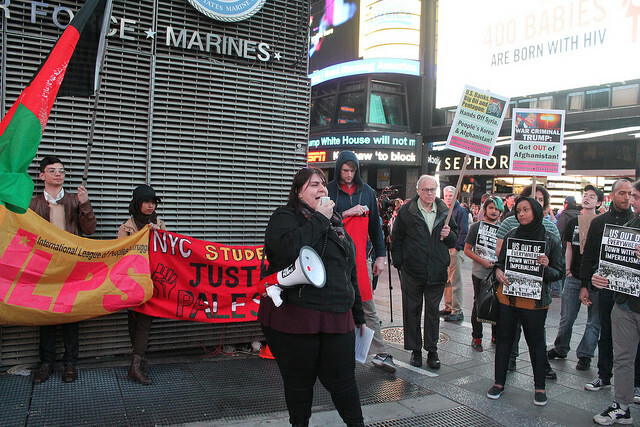 New York activists protest U.S. bombing in Afghanistan | Fight Back! 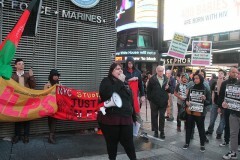 New York, New York – About 50 protesters gathered at the U.S. Military Recruiting Center at the heart of Times Square, April 14. The protest was an emergency response to Donald Trump’s escalation of the war on war on Afghanistan. On April 13, a GBU-43/B Massive Ordnance Air Blast Bomb (MOAB), nicknamed the "mother of all bombs," was dropped on what is purported to be “ISIS targets” in Afghanistan. This is a continuation of a conflict started by the U.S. and NATO 16 years ago, the longest imperialist war the U.S. has ever been in. The dropping of the MOAB on the Achin district has death counts estimated to reach up to 94 people, and a blast radius estimated at one mile. Michela Martinazzi of the Freedom Road Socialist Organization (FRSO) and ILPS had this to say, "Yesterday a 21,000-pound bomb was dropped in Afghanistan. Last week 59 tomahawk missiles were launched into Syria. We have a fleet encroaching on North Korea, and we just put troops in Somalia after 20 years. Donald Trump is beating his war drum and we have to demand an end to all U.S. wars. Demand an end to the U.S. war machine! Demand money to be spent here for jobs, healthcare and education!" Ann Wright, of Veterans for Peace, a former member of the U.S. military and noted anti-war activist, also attended and spoke. She stated, "I’ve been protesting the war since I resigned from the military and the U.S. government 15 years ago. If I could resign today, I would." Trump is simply another warmonger intent on destabilizing oppressed nations in the interests of capitalism. Trump’s actions do not simply mirror the harmful U.S. actions in places like Syria, Libya, Yemen, Iraq, Somalia, Vietnam and countless other nations; they are a direct and aggressive escalation. On April 7, Trump launched 59 Tomahawk missiles at the Al Shayrat Airfield in Syria, a direct act of aggression against the popular government of President Bashar Al-Assad. Rather than condemning an action Trump had himself once warned against, the neoliberal politicians in both the Democratic and Republican parties praised Trump’s actions.